Have what you want on the network you want. Verizon. Overages are a thing of the past. Including messages from the U.S. to other countries. Use it all yourself or share with up to 10 devices. CHOOSE FROM THE LARGEST SELECTION OF DEVICES. 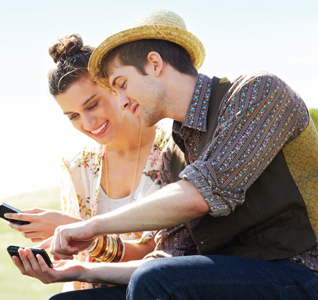 Get a new phone any time you want to on America's largest and most reliable 4G LTE network. *Offers available in select TX and LA markets, area codes and phone numbers. Eligibility to keep number varies. Bill credit applied within 2–3 billing cycles. 10 GB of bonus data per month for 12 months on any MORE Everything Plan 10 GB or higher. One bonus data offer per account. †And $15/smartphone line on Edge. Taxes/fees apply. **Free 2-Day Shipping when you order online Monday–Friday by 4:00 pm. Available for purchases placed on vzw.com for delivery within the U.S. only, excluding Alaska and Hawaii. Our Surcharges (incl. Fed. Univ. Svc. of 17.4% of interstate & int'l telecom charges [varies quarterly], 18¢ Regulatory & 95¢ Administrative/line/mo., & others by area) are in addition to monthly access & not taxes (details: 1.888.684.1888); gov't taxes & our surcharges could add 11%–30% to your bill. IMPORTANT CONSUMER INFORMATION: Subject to Customer and Edge Agmts. & credit approval. Eligibility to keep number varies. Offers & coverage, varying by svc., not available everywhere. Limited-time offers. DROID is a trademark of Lucasfilm Ltd. and its related companies. Used under license. All company names, trademarks, logos and copyrights not property of Verizon Wireless are the property of their respective owners.